Please send me your snail mail address, Lisa Marie! Thanks so much to you all for participating. If any of you make quilts with this block, please send pictures! As you know, usually I try to answer every comment, but I am so behind on emails I haven't had a chance. I apologize We are awash with Nutcracker rehearsals here. The kids have their first performances this weekend and we are doing our best to enjoy the moment. Hope everyone is enjoying the special holiday season! Congratulations, Lisa Marie! I know you will enjoy those! 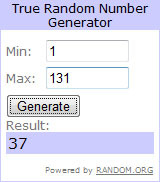 Thanks, Amanda, for hosting such a nice giveaway! Congratulations to the winner! Well done!